You have decided to graduate from the dreadful, rough, pulling, and nicking experience of a cartridge razor. We can’t say we blame you. Which is why you have decided to turn to the safety razor. You are in good company, as many people have made the transition over to safety razors, and have never looked back since. Why is that? We will get more into detail about the benefits of getting a nice, clean, razor-burn free, and close shave below, but let’s look at some essential things you should look for when you are looking to buy your first safety razor. Is it too light or heavy? Always consider how the razor is going to feel in your hand. If it is too heavy your shaving experience is going to be less than pleasant. Below, is a list of safety razors, and a variety of weights to best suit your comfort levels. Also, regardless of the weight, do not apply further pressure to your face, this can cause cuts and nicks. Just let the razor work its own magic for the best performance. What handle will work best for you? Whether you are a veteran of the safety razor, or a rookie, looking to try it out for the first time, the handle is another feature that will determine how comfortable your shaving experience will be. Most men prefer longer handles, as it gives them more flexibility and convenience to hard to reach areas, such as the nose or neck. Also, for men with larger hands, a longer handle will benefit them most. Is it a double edge or singe edge razor? Double edge safety razors offer a better-quality shave because of its higher quality steel razor blade, than a single edge razor would. They have sharper edges and a longer lasting sharpness. A double edge blade is going to save you time and price as they extremely cost effective, and most can be purchases at an affordable rate. Is the razor an open comb or a safety bar? An open comb razor blade is expose, in which they have diminutive or little teeth. These little teeth help guide your facial hair to the blade of the razor. Safety bars are hidden behind the metal piece of the razor, which may be more suited for a beginner, because it reduces the chances of getting nicked or cut. 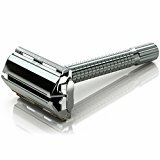 Is the blade a 3 piece or a butterfly safety razor? A butterfly safety razor has one solid piece, where a knob is twisted to open the top plates to expose the cutting head. While a three-piece razor has the top, base of the head, and the handle, that all come apart. The three-piece safety razor is more popular with veteran shavers. This is because it makes the razor easier to clean and it lasts longer. When your face requires a clean and close up shave, while getting a comfortable and easy maneuverability with your razor, the German made, and quality assured, Muhle R89 Closed Comb Safety razor is the top choice to have. This safety razor is corrosion resistant, which means you’ll get a long shaving journey with it. Not only does it have an impressive, eloquent finished design it pulls out the whole works to go along with making it one of the more affordable and durable safety razors on the market. No trouble necessary replacing the blade, as it has a cap, that you simply unscrew to easily place the next long-lasting blade. As customers often call the Muhle Safety razor, “Absolutely first class,” being not too aggressive, but sturdy enough to give you the proper shave you need first thing in the morning. l 3 piece construction allowing you careful cleaning and easy blade exchange. l German manufactured so you know that quality is a premium. l Finely engraved handle giving you the great grip possible during wet shaves. l Stylish classic look to give your bathroom a dignified look. l Light-weight making it much easier to maneuver around, especially in those hard to reach areas like under your nose, or the sensitive spots on your neck. l Durable and sturdy. You’ll never want another razor after using this. l Strong body making it a much need and easier razor to balance. l Affordable and great for beginners. There are safety razors, and then there are Merkur safety razors. Merkur continuously delivers a rich and long-lasting experience for each person that uses their razor. This is for men amongst boys, easily for men with larger more defined hands, with the long handle of the razor giving you the reach and extension you require during a shave. Gentle maneuverability, and light weight, so you don’t have to worry about awkward angles being too hard on your hands. Merkur 23C has such a great style to it, a chrome finish, steel frame, and a stamped logo textured grip. When you are wet-shaving, enjoy the luxuries of a stern, non-slip grip, that the four-inch handle is built for. A lot of customers have discovered this razor, as it is a longer handled version of the traditional 33C with the classic head, and cannot go back to anything else. 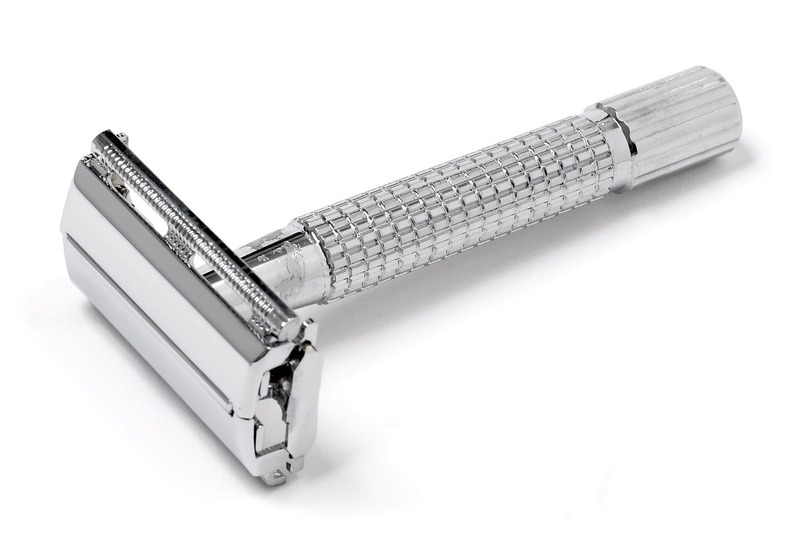 With it’s affordable price tag, and it’s sleek, sharp design, Merkur’s reputation of producing a quality, clean and close shave, never fails themselves. l Chrome finish, that will sharpen up your bathroom accessory area. l German made, so you know it’s made with quality to last you a long time. l Straight guard for a close-up shave. l Simple, quick, and easy blade exchange, use any double edge blade for replacement. l Easy to use, and made for every level of shaving experience; beginner or pro. 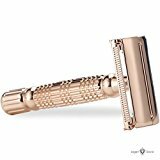 If you are looking to buy a razor as a gift for someone, and want to impress them with quality and elegance, then you’ve most likely been looking at Jagen David B30 Butterfly Safety razor. When you buy this razor, it comes with a superior Jagen David traveling case, which is both impressive and convenient. Let’s say you want the razor for yourself, but you have never used a safety razor. Shave gently with this model, it isn’t meant to be forced onto your face or beard, because that will likely lead to bleeding or cutting. That said, when applied light it should be, you get the full effects of a close shave, with the double edge blade and closed comb DE head. When you need to replace the blades, simply twist the knob to lift up the top plates for an easy and quick exchange. With its thinner designed handle, you can simply get to your neck without any limitations. For those who have just started the safety razor experience, this razor could tailor your needs as well. While shaving at a 30 degree angle, this razor gives your face a close, clean, and cut-free shave. l Butterfly DE Head making it very easy, and quick to replace your old blade with the new one. l Comes with a classic looking Jagen Davis traveling case, which makes your traveling experience easy and convenient. 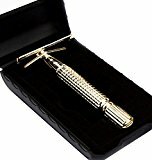 l Slim handle, giving you better reach with those harder regions that need to be shaved. 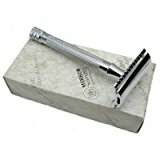 l Affordable, at this price tag, you really can’t beat it, while getting a quality safety razor. A safety razor that is friendly for beginners, as well as women, the Jagen David B40 design offers a lighter shaving experience than its counterpart, the B30. Comes with the same Jagen David traveling case, giving you the luxury of holding your razor in style and grace. It’s double edge, making it twice as safe and comfortable when you are gently stroking the skin with the blade. 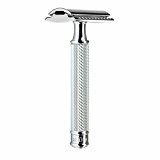 Shave pressure free with this safety razor, has it has incredible balance of weight, making it easier for you to use and comfortable. This razor’s replacement blades are much more of an affordable option than most multi-blade razors on the market. l Access, you can get to the hardest spots, where you might not trust a standard razor to do. Enjoy a comfortable and worry-free shave on the neck and under the nose. l Easy blade replacement, just simply unscrew the cap to get your old blade out. l Nice silver chrome finish with an impressive sleek head design. l Comes with an elegant traveling case by Jagen David. l Double edge razor blade system, offers you the closeness, while safely shaving. l Versatile head, can fit any standard double edge razor out on the market. We finish the list with another impressive, and stylish Jagen David safety razor. What a gift this would be if you were to buy it for someone, but honestly you should just keep it as this is easily for its price, a great buy of quality. It’s not a big razor, although it is heavy enough, and extremely durable, you can get in close on that annoying stubble. Throw in the traveling case, that comes with a mirror on it, then you have yourself quite the kit. It’s a handsome looking razor, with a silver themed design, like most of Jagen David safety razors. There is an option of gold that can be found and purchased. This razor is typically better for someone who has used a safety razor, but if you are just getting into the hang of things with safety razor’s, be sure to gently apply the blade to your face. The precision of these blades are fantastic, and can do the job on its own without any mounted pressure. Impressive head, and sleek handle design as well. If you are looking for an affordable, yet durable razor, I suggest looking at this design, or the two above it. l Traveling case with mirror, making it easier and safer to bring your safety razor along vacations or work. l Perfectly sized, not too intrusive on the hand. l Compact and close precision shave, with its double edge blade. As you can see, there are many reasons why you need to throw away that disposable shaver you’ve been using for years. You need a quality safe experience, and that’s exactly what you’ll get with Jagen David, Muhle, and Merkur. They’ve been providing customers. a safe, close, precise shave for many years. The razors above don’t only look impressive, with their dazzling chrome and silver finishes, but they get the job done without beating up your face. This is really the way to go in terms of saving money, and treating yourself to a durable, and quality shave.